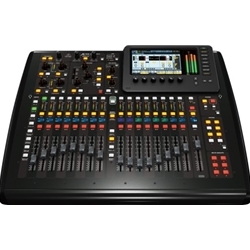 Behringer's X32 Compact digital mixer packs everything you need to easily mix and record a live show into a svelte, roadworthy package. But with its amazing-sounding Midas-designed mic preamps, this mixer is also at home in the studio. The X32 Compact's 40 inputs and 16 mix buses give you the flexibility you need, while a USB interface delivers instant compatibility with major DAWs. You also get serious signal processing that can be quickly configured for sessions of any size. Factor in its amazingly intuitive interface and you have a winner: Behringer's X32 Compact is for you. Behringer X32 Compact digital mixer's X-USB interface lets you record your tracks straight into your DAW. How convenient is that? Right out of the box, you get compatibility with ProTools, Logic, Cubase, Studio One, and nearly any other ASIO or Core-Audio compatible DAW!